Vertebroplasty and Kyphoplasty are proven vertebral compression fracture treatment with a 20-year clinical history. AI3 is the ONLY Interventional Outpatient Center in the Tampa Bay Area. Since we are an outpatient center, this procedure requires no hospital stay and for this reason, patients could benefit from cost savings over the typical hospital setting. Fragility fractures are a serious and growing problem for older adults and the healthcare system. In fact, 50% of women and 25% of men will have an osteoporotic fracture in their lifetime. Vertebral compression fractures (VCFs) are the most common with an estimated 700,000 such fractures reported nationally each year. Vertebroplasty and Kyphoplasty offer a proven and safe treatment that assures the best quality results for your patients and the healthcare system. This minimally invasive, image-guided treatment, in which bone cement is injected into the vertebral body, significantly decreases pain and increases mobility in more then 90% of patients. The stabilizing of the fracture helps protect against further collapse of the treated vertebra, thereby preventing the kyphosis commonly seen as a result of osteoporosis. What is a Vertebroplasty and Kyphoplasty? Vertebroplasty and Kyphoplasty are minimally invasive treatments for patients with compression fractures of the spine (vertebrae) who have not received pain relief from conservative methods including strong pain medications, prolonged bed-rest, external bracing, etc….The procedure returns the structural integrity of the collapsed vertebrae utilizing x-ray guidance (fluoroscopy) to accurately place specially formulated acrylic bone cement into the veterbral body. You will receive intravenous (IV) conscious sedation, a combination of a sedative (sleep inducer) and a narcotic (pain killer) for your procedure. This is commonly referred to as “twilight sleep.” You will lie on your belly for the procedure. The doctor will make a small nick in the skin near the spine. Using X-ray imaging he will insert a small needle and guide it into the vertebral body. Specially formulated acrylic bone cement will be injected into the vertebral body. The needle is removed and the cement is allowed to harden. The small opening is covered with a bandage. This procedure takes about one hour. You will spend from 2 to 4 hours recovering in the post care area under the care of our clinical staff (critical care trained registered nurses). You will receive IV fluids and be given something to drink and eat. Upon discharge you will be given a prescription for pain medication. Recovery time is about 24-48 hours. Will my insurance cover the Vertebroplasty and Kyphoplasty? 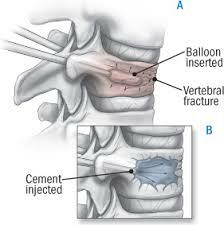 Most insurance companies do cover the Vertebroplasty and Kyphoplasty procedure. We have a staff member solely dedicated to obtaining verification from your insurance as well as authorization if required.